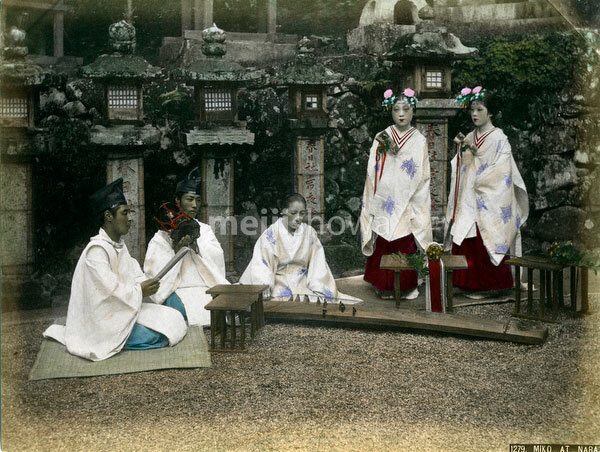 Two shinto priests and three miko (巫女, shrine maidens) perform a religious ceremony at Kasuga Taisha (春日大社, Kasuga Grand Shrine), an important shinto shrine in Nara. One of the priests is holding a tsutsumi (also tsuzumi) shoulder drum, while one of the miko plays the koto, a harp-like instrument. The other two miko hold kagura suzu bells (神楽鈴).